Last fall, I stocked up on several kinds of winter squash from Gage's Garden's and the Farmer's Market in Spearfish. I've been storing them in our basement where it's quite cool. Last night I cooked this acorn squash and it was really delish. Simple: Slice in half, scoop out seeds and put on racks in 350 over for about 45 minutes. One of the best part of the winter squash experience is the seeds. I cook any and all seeds that come out of a winter squash. And not just pumpkin! In fact, acorn squash seeds are large and rather goo-free. These are some of my favorites. 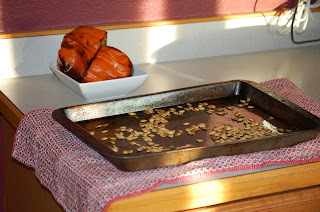 425 oven, spread seeds out on cookie sheet with a little olive oil (mix together so seeds are covered) and cook until you hear popping! Yes, the seeds pop just like popcorn, which, hey, it's a seed! Once or twice I open up the oven and mix them around a bit as it helps them cook evenly. When they are done, I put them on a kitchen towel (sometimes they stick to a paper towel) and add some salt. Yum! My favorite on the way home from work snack is a mix of seeds, pecans, cashews, raisins, candied orange peel (so easy) and little broken up pieces of dark chocolate.